American Darts resmbles poker in one aspect. Even though there is a commonly agreed upon game for major competitions, there are a near endless variety of games you can play. On this page I'll be listing some of the different group dart games. 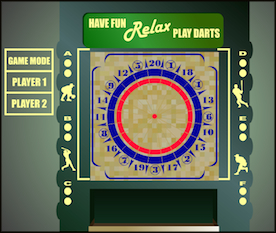 Group darts means that all of the darts being used in a player's turn are thrown at the same spot on the dartboard. Baseball is a group darts game since all three darts are thrown at the same inning. Three innning games are quicker than a full game of baseball. They also allow the player choosing the innings to choose the ones he feels most comfortable shooting. There are no common three inning games, just pick three innings, and shoot at them. A five inning game doesn't last as long as a full game of baseball, but since players have more darts to throw than in a three inning game, luck plays less of a role. Generally players will play innings one through five. It's a lot easier to remember that way, but playing five randomly chosen innings isn't uncommon. There are two sections of a dartboard that often come into play in a game of baseball, but are not innings one through nine. Those sections are the cork (used for determining shooting order), and the tenth inning (used to break ties). Often players will include these areas when choosing games. One such game is three inning game of 10 - 14 - 10, which brings up the concept that it is ok to choose the same inning twice inside of a game. The common three inning game that uses the cork is 6 - 11 - cork, with the cork scoring as five points.